I’m a mom of six children. I’ve been homeschooling eighteen years, and with three preschoolers, I have another eighteen years of homeschooling to go! Three of my children are adults. Cory is twenty-three years old, married, and he and Katie have a baby boy and one on the way. He’s a working man and a caring husband and father. Leslie is twenty and graduated from the University of Arkansas, Little Rock, this year. She’s a stellar student who’s living in Europe as a missionary right out of college. Nathan is twenty years old and a college freshman. After one semester of college, he was asked to work as a writing coach in the university’s writing center. Even more important than how well they’re doing in life, my three older kids love God and have a deep, growing relationship with him. We also have three more kids ages five, three, and two who’ve been added to our family through adoption. As a forty-one-year-old mom, sometimes I’m overwhelmed with thinking of doing it ALL again, but if there’s one thing I’ve learned it’s to focus on one day at a time. And focus on one heart at a time. I started off by telling you of my older kids’ successes in education and life because I want you to know it is possible. If you would have told me three years, five years, or seven years ago where my kids would end up, I would have been relieved — but confused. I often fought with my kids on getting their work done. They seemed unmotivated at times. Some (most?!) of their work was done half-heartedly, and there was one child who just could not “get” the read the book and answer the questions model. “But what about geography and geometry and all those other critical subjects?” I prayed (and fretted.) Still, God kept the answer that He spoke to my heart the same. Truthfully, it looked completely different for each kid. I signed one up for co-op classes, one for some college classes, and one did hardly any traditional work at all. Trying to get my youngest son to answer a worksheet was futile, but I did discover he loved watching DVD courses of college lectures. Except for some math and language computer programs, for three years this kid watched DVDs for homeschool — classes about history and science and notable people. And the he told me about what he learned. He also like to write fictional stories on the side. Stories I never edited, never graded. Stories that were focused more on his imagination than on his education. This child hadn’t written one essay at the time he started at our local university. Yet this was also the kid who got an A on every university paper he’s ever written and was asked to be an intern at the writing center as a freshman. Looking back, what God was asking me to do was to coach my children to grow into godly people who loved to learn. Looking back, I can see this is far more important that learning the periodic table — but at the time I was so overwhelmed and stressed that all I focused on was what my kids weren’t learning. Why are your older kids fighting your teaching? It doesn’t fit their style. It doesn’t fit their interests. You’re more focused on the lesson plan than him (or her). You are comparing him to others — other students, other siblings. You are thinking of this semester — this year — instead of who God designed your child to be and God’s plan for his life. 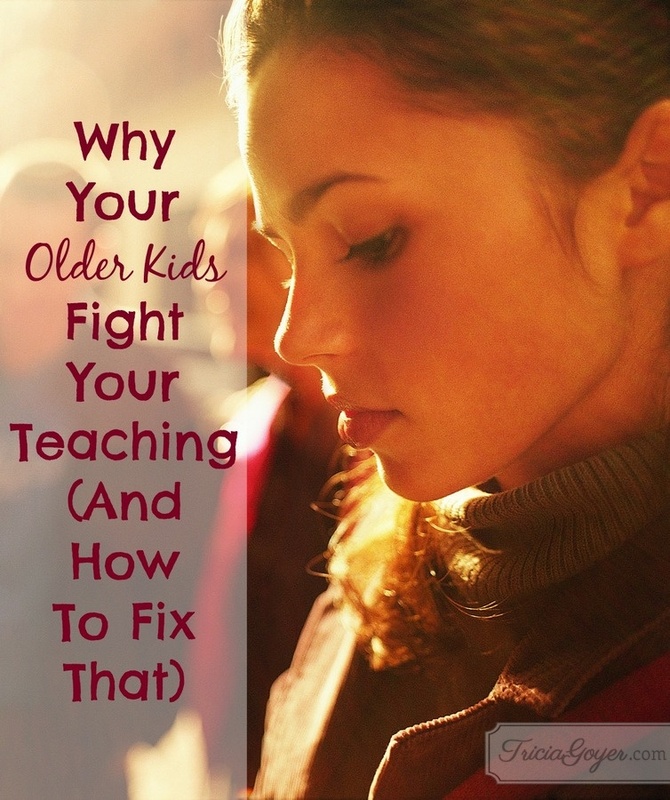 Keep reading to find out why your older kids are fighting your teaching and to find out a solution! I have a few books on sale right now! The Swiss Courier and Chasing Mona Lisa are only $1.99! And Generation NeXt Marriage is $2.99. You can also get my four World War II novels in the Liberators Series for $13.99. I wish this had been available to me when I raised my Children. I definitely want to share this with my children, I am sure it will give them a world of insight and thought regarding their own children, and perhaps guide them to what is most important in the lives of their family. These things are also true for those youngsters being “educated” by the public school system. It’s such a shame that we lump them all together as if they all learn the same way. We lose more talent and gifting than we produce with this method. I agree. It’s so important to find each child’s gifts and talents! I was a homeschooling Mom of 5 for 25 years. I can relate to your comments SOO well. I too faced days of frustration and brick walls. Like you I found that finding the right approach for each child was very important and never comparing them one with another. But after all those years I too can say that I am truly blessed to have 5 adult children who love the Lord and are contributing members of society. That is awesome, Shirley!!! It is a blessing, isn’t it? I wouldn’t have done it any other way. Thank you so much for this wisdom. Pinning now. Take heart Momma! My husband and I have 7 children ages 37, 36, 21, 16, 10, 8, and 6. I will be 68 years old when I am done homeschooling my youngest. It is a calling to adopt and a calling to homeschool. The days can be tough but the blessings are beyond belief!